I've encountered an interesting breastplate. It appears that originally it was a standard French cuirassier issue- Klingenthal Arsenal marked and dated 1831. However all the decorative brass bosses have been replaced with steel rivets finished flush with the outer surface. The studs for attaching the shoulder straps have been filed flush and steel straps 2cm wide formed into loops have been riveted on the shoulder-apparently for attaching straps to allow wearing of the breastplate by itself. The modifications are well done suggesting the work was performed in an armoury. Also pitting and patina are consistent indicating the modifications are old. Does anyone have any thoughts on why or where this piece was modified? Germany got possession of the Klingenthal Arsenal after the Franco Prussian war and did issue French produced cuirasses to their cavalry. Also I believe German cuirassiers stopped wearing backplates on parade after 1900 so I wonder if this is a German rework. Or could it be a piece repurposed for trench warfare? You won't get much help without pictures. Thanks for the suggestion but there is not much to see. 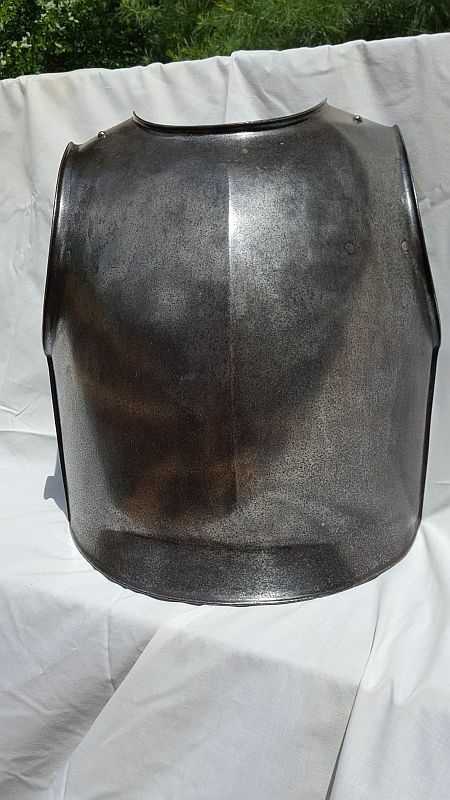 Just a typical French cuirassier breastplate with all surface protrusions removed and replaced with flush rivets. 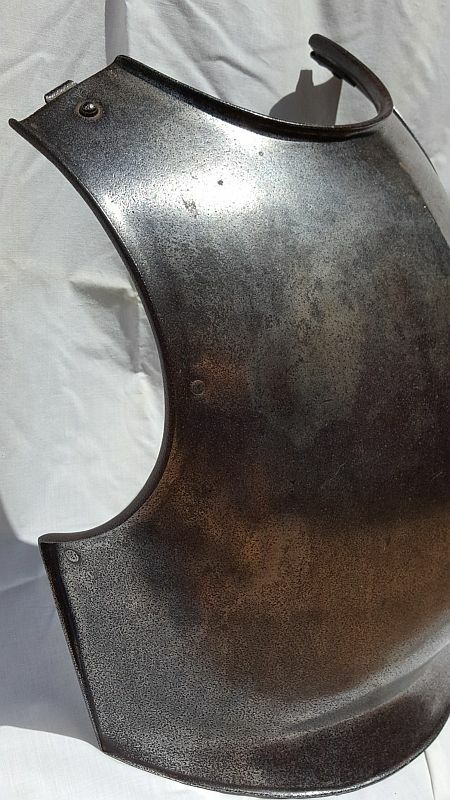 I've taken some photos but they just look like a simple breastplate that could date from the 1600's to WW1 but I know this one is 1831 and manufactured at Klingenthal. As Dan said, even if it is "standard", pictures will help. The details available in a photo are much more useful than even the best written description. The simplification of the piece to achieve a more generic look puts me in mind of modification for a theatrical prop. Thanks. I'll try to get decent pics of the details. Thanks Sean. That is always possible with what would have been considered not that many years ago as obsolete military junk. But it is rather heavy (I held it on my chest and thought it would be quite uncomfortable after a short while without a lot of padding.). Also the modifications are substantial-maintaining the integrity of the armor -not just cosmetic. It makes me think the purpose could have been to present a glancing surface to deflect projectiles or weapons . .... It makes me think the purpose could have been to present a glancing surface to deflect projectiles or weapons . That definitely sounds like armour. Would tend to think that it might be a modification for WW I trench warfare, as you stated in your first post. There was some experimentation, both abroad and in this country to provide protection against shrapnel, for example, a variety steel helmets (some with face plates), armor for machine gunners, etc. If only these pieces could talk! That's what has me so interested. Copy that. It would be fascinating to know the details. Because of the origin I'm thinking it must be a French or German effort. It doesn't look like any of the German trench armor I've seen in photos but improvised weapons will probably lack documentation. Why can't we see some photos? Without photos all of this is just baseless speculation. Dan--I'm working on that. May take some time. But there is really not much to see but flush filled rivet holes in a standard French cuirassiers breastplate. However maybe some pictures of the modifications shoulder strap attachments will be of use. I'm not holding out on you guys. I just need to get access to the breastplate to get some good photos. Stay tuned. With all due respect, I still can't help but feel that you are greatly underestimating the keen eyes and expertise of the people here. Just because you don't believe there's much to see doesn't mean there isn't much to see. So yes, please post pics when possible, I'm sure they will have educational value to many here like myself, regardless of how mundane the piece may seem. Scott--I need to be out of town for the next 10 days but I should be able to get the pics and post when I get back. I'm very impressed with the interest the people on the forum have shown regarding this topic. I have been researching this piece and have run out of places to look for more information. Hopefully someone out there may have some clues and , if not , as you said there could be some educational value. As promised, I am attempting to attach pictures. Hope they prove to be helpful/instructive. Side view showing some of the flush rivets. Inside is more important than outside. Need pics of the inside along with closeups of any detail. ="Dan Howard"]Inside is more important than outside. Need pics of the inside along with closeups of any detail.[/quote. Dan--What specifically are you looking for? I can post more pics but I not sure what to photograph. 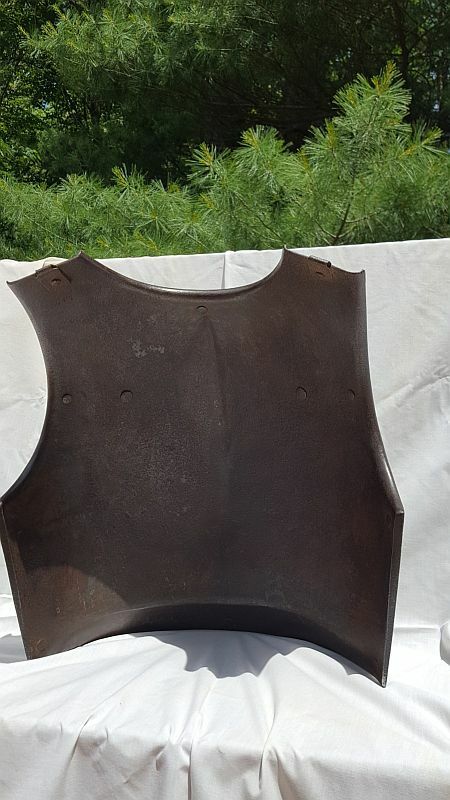 The back of the breastplate as shown in the photo is tight brown rust with the heads of the rivets used to plug the holes where the decorative bosses were removed slightly protruding. The Klingenthal signature and date are there as mentioned in my original post but are lightly engraved in script but are quite difficult to see. (I needed to use a flashlight at an angle to read them.) I can try to photograph it or any other details that may help you. Just let me know. Did it have some kind of liner and if it did, what kind? Was it repaired at any stage? Did it originally have a backplate? If it did, how was the breastplate attached to the backplate? If it didn't, how was the breastplate fastened to the torso? I will post some close-ups of the inside soon. Waiting for good outdoor lighting. Maybe someone will see something I missed. In the meantime I can answer these questions based on my examination. There are no significant hammer marks. I believe the cuirasses produced by Klingenthal at this point were formed using a press. There is no sign of a liner such as fragments of cloth or leather around the rivets. There is no evidence of a repair with the exception of the rivets finished flush with the front surface that fill the holes left when the ornamental bosses that were standard on French cuirassier breastplates were removed. 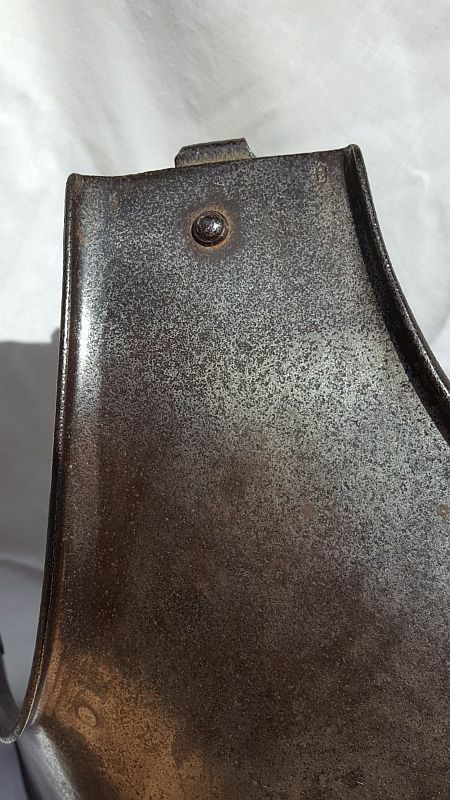 It appears that it originally had a backplate as the studs on the breastplate that would have been used to attach the straps from the backplate are evident but they have been filed flush with the surface. As can be seen in the previously posted photo iron loops have been attached to the shoulders to attach straps.